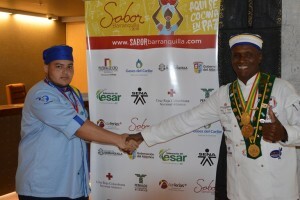 WILLEMSTAD - Curaçao recently participated in the culinary exhibition ‘Sabor Barranquilla’. 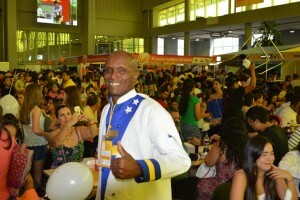 This year 25.000 people visited the fair which was held in Barranquilla, Colombia. During these past years the exhibition grew immensely and is considered one of the main culinary exhibitions in Colombia. With an exhibition area of more than 2.085 square meters, 1800 persons working and with an increase of 200% to 2015, Sabor Barranquilla is considered a huge success. The fair lasted 3 days and at the same time highlighted the grand opening of Barranquilla’s newest event center, Puerta de Oro. 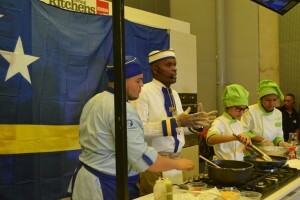 Curaçao was joined by more than 115 culinary exhibitioners from different destinations that were present this year. Our very own Chef Broertje Marshall, recently awarded during ‘Amé Tauná’ gastronomic competition held in Bolivia and Chef Dane Ribeiro member of Curaçao Culinary team represented Curaçao were they offered our local dishes to the visitors. They presented among others: Salmon, ‘Tutu’ with fish and ‘Quesillo’. The Curaçao team was complete, thanks to partner InselAir, that together with CTB and CHATA made it possible to promote Curaçao as a favorite Caribbean destination, meanwhile InselAir sold tickets to Curaçao on the spot! CTB, CHATA and partners are doing their utmost in promoting Curaçao within the culinary market. Annually many visitors visit Curaçao to indulge our local ‘krioyo’ dishes, therefore the exhibition Sabor Barranquilla is an ideal platform to promote our local cuisine as well.